The Great Ummayyad Mosque remains one of the great symbols of the glorious period of Muslim civilisation and its pride. It is a master piece of architectural ingenuity having a decisive influence on the maturity of mosque architecture all over the Muslim World. The mosque was the birth place of a number of key elements in Muslim architecture such as the horseshoe arch, the square minaret and the Maqsurah. Historically and culturally it is still one of the oldest and holiest shrines of Islam. From early years of Islam's arrival to Syria (635AD), Christians were granted freedom of worship and continued to use their old temples. Further tolerance has been shown by the Muslim/Christian partnership of an old derelict temple1 which the Christians, at the hands of Theodose (379-395), transformed into a church named St. John the Baptist. Such partnership was established by a treaty concluded between them and the Prophet's companion Khalid Ibn al-Walid. Muslims, for well over half a century2, worshipped in the eastern side of this building until the arrival of Caliph Al-Walid I (705-715). A renowned patron of great architectural projects3, Al-Walid decided to erect a separate mosque for the Muslims to accommodate their growing numbers. After long negotiations with the Christian community of Damascus, Al-Walid bought the derelict site and the construction began. In summary, concerning the circumstances of the foundation of the Muslim building (Great Mosque), I believe that the examination of very ancient texts has led us to think that Muslims and Christians, following a treaty, indeed shared an edifice but it was not the Church of St. John the Baptist. All indications show that it was an antique perilobe where there was space for two buildings. Although Muslims were apparently given possession of the total area, they tolerated the existence of the church and allowed Christians the freedom to exercise their rituals." From the above, it appears that Muslims inherited a large sacred site belonging to Antiquity (Jupiter as suggested by Creswell) and later was partly occupied by the Christians who built St John church some time under early Muslim rule (according to note 5). Muslims at first prayed in open air, but by the arrival of Caliph Al-Walid they erected the mosque in the south eastern7 part of the complex. Further evidence of this was the discovery of relics belonging to St. John in a crypt in another locality away from the site of the mosque. Such thesis was also endorsed by Sauvaget (1932) and Creswell (1959) who confirmed that the site did not involve St John's Church. Historic sources revealed that the building work started in year 87 AH (705 CE) and was accomplished in year 96 AH (714), costing the Caliphate the whole income from the land Kharaj8 of 7 successive years (Ibn Al-Faqih, chapter 1, pp.106-108). Al-Idrissi, however, quoting Arab sources, indicated that the cost reached the Kharaj of two successive years only. In relation to the workers, the sources revealed the involvement of Persian, Indian, North African, Egyptian and Byzantine masons and artists. Al-Muqdassi claimed that the Byzantine King offered his builders and artists some delicate material for the construction, in particular mosaics. 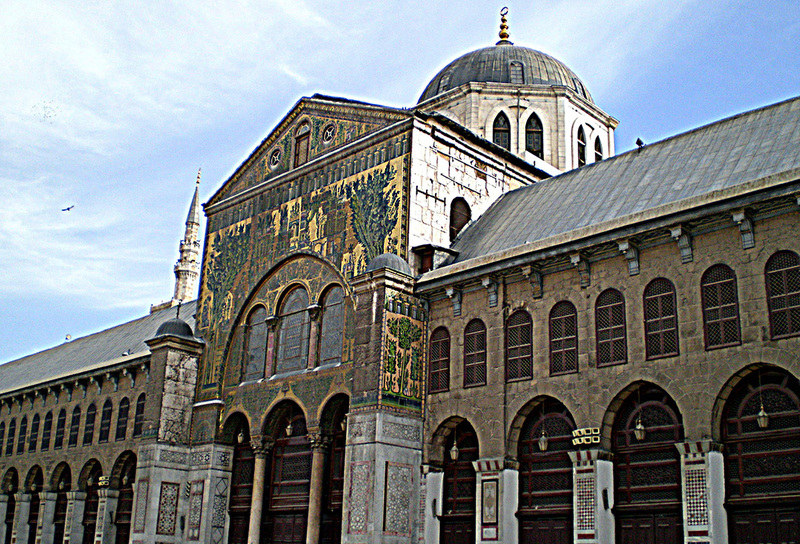 Such claim made many scholars (Muslims and non-Muslims) link the Ummayyad Mosque to the Byzantian building style. They wrongly insisted the Mosque to be an imitation of the three nave basilica of (the ruined) St. John. Creswell (1958) demonstrated such false claims by comparing the size and character of contemporary Syrian churches to those of the Great Mosque which he found were too small for the size of the Mosque. He concluded that St. John could not have been of this size. This was also the view of Strzygowski (1930) who believed the Mosque to be purely Muslim work inspired by Persian influence. The whole layout is rectangular of 157 by 100 meters and consists of two main sections (figure 1). The courtyard occupies nearly half of the site with a length of 122.5 and a width of 50 meters, surrounded by galleries of horseshoe arches. It contains three structures of polygonal form standing on columns and topped with domes. The oldest and most important of these is the treasury building, Bayt Al-Mal, which was built by Caliph Al-Mahdi in 778 CE in the western side of the courtyard9 (figure 2). Its purpose was to accommodate the treasury of the Muslim State. The dome of the clocks occupies the eastern side of the courtyard while the octagon of the ablution fountain takes the central position. This rectangular open courtyard based plan reflects the inspiration of the Prophet's Mosque in Medina, which was later reinstated in Kufa. It seems that the Ummayyads after their experience with the covered plan in the Al-Aqsa mosque in Palestine, which is thought to be derived from the basilican church, was in fact a return to the open plan adopted by the Prophet Muhammad and the first four Caliphs10. The southern part of the site is occupied by the prayer hall and the sanctuary. This is another large rectangle containing three aisles which run from the eastern to the western parallel of the Qibla wall (figure 3). The middle of these aisles is crossed by the nave which is in the form of transept and runs north from the main gate (which opens to the courtyard) to the Qibla wall at the Mihrab in the south. This nave is 20 meters wide defined by four large piers and consists of three squares. The first contains the main mihrab, the second includes the dome, while the last connects with the door. Each of the aisles rests on 20 column arcades (10 on each side of the nave) with varying widths; 11, 13 and 12 meters respectively. The Qibla wall is pierced with four mihrabs spreading along the wall distance. In addition to the main mihrab (figure 4) which occupies the centre and is emphasised by the dome and the nave (transept), there is the Prophet's companions mihrab which is located to the east of the first mihrab. The Hanafite as well as a fourth Mihrab are located to the west. The Mosque is supplied with three unusual minarets dominating the sky of Damascus. The peculiarity of these minarets appears firstly in their unusual odd number as the customary number was one, two, four or seven as found in the Kaabah, Al-Haram As-Sharif. The other peculiar feature is the varying design of these minarets (figure 5). The Minaret of the Bride, Midhanat Al-Arus, is the oldest11 and was built between the 8th and 12th centuries. Its square shape represents the earliest known minaret of its kind in Muslim architecture. The Minaret of Jesus, Issa, built in 13th century, has a square base and is raised with a cylindrical shape resembling late Ottoman minarets. The Minaret of Quait Bey (15th century) has a polygonal shape imitating those of the Al-Azhar Mosque. The access to the Mosque is through three main gates. The main one is pierced in the centre of the northern wall. It is a monumental portal with three bays, the central being the widest. The other two doors were flanked on side walls to the east, Bab Jayrun and the west, Bab Ziyada. In year 715 CE, Al-Walid built a maqsurah which enveloped the Mihrab and Minbar. In year 778, Al-Mahdi added the Treasury (Bayt -al-Mal) building. Between 1068-1069, the first fire consumed most of the mosque except the walls. The mosque was restored by the Seljuk leader, Tutuch and his vizier Malik Shah between 1082-1083. In 1166, the second fire destroyed the eastern gate of Bab Jayrun. In 1174, another fire consumed the northern minaret, Midhanat al- Arus. In 1202, an earthquake destroyed parts of the mosque. In 1206, the floor of the courtyard was redone. In 1214, the sanctuary floor was covered with marble. In 1216, some works were carried out on the dome. In 1247, the south east minaret was damaged by fire and was restored two years later. Between 1326-1328, the western wall of the sanctuary was rebuilt and decorated with mosaics. In 1401, the Mughals invaded the Mosque occupying its courtyard with their heavy machine guns and the whole mosque was transformed to barracks for their army. In 1479, another fire consumed the western minaret, Bab Al-Ziyada and Bab al-Barid. In the 17th century, the Minaret of Issa (Jesus, PBUH) was rebuilt. In 1893, another fire ruined most of the building especially the sanctuary. It was restored to its full glory, including the replacement of most of columns and dome, between 1904 and 1910. The Mosque as mentioned above held a pre-Islamic religious sacredness. By becoming a mosque, this structure was transformed into a centre of the Muslim Caliphate (especially in the Ummayyad period) with its enlightening rays reaching the furthest parts of Muslim land in Asia, Africa and Europe. 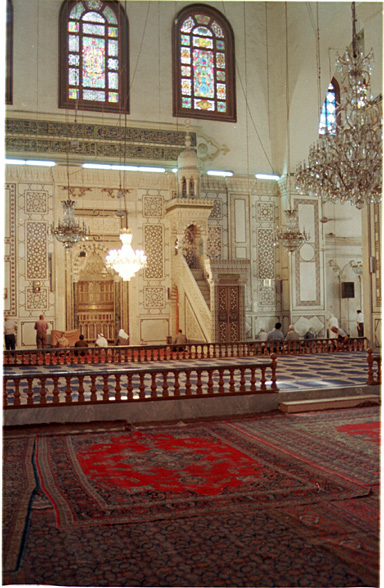 Historic sources, mainly attributed by Muslim historians, connected the mosque with a number of religiously celebrated figures. The first connection has been established with John the Baptist, also known as Prophet Yahya, whose remains were incorporated within the mosque. Ibn al-Faqih reported that Zayd Ibn al-Waqid, who was the head in chief of the works on the Mosque, discovered the scull of Prophet Yahya in a nearby cave and that Caliph al-Walid ordered it to be reburied in one of the Mosque piers known as Amud al-Sakasik. Today, it is believed that these relics lay in the Mazar, a Maqsura in the eastern half of the sanctuary. Harawi noted (in 1173) that the black and white marble columns that support the dome of al-Nasr (the dome in front of the mihrab) belonged to the throne of Bilqis, the queen of Saba. The same source made other unsubstantiated claims such as the mosque containing a stone belonging to the rock which Musa, Moses, struck and from which 12 fountains erupted12. The eastern minaret (called the white minaret or the Minaret of Issa) is believed to be the place where Prophet Issa, Jesus, will descend13. The Islamic tradition is also said to have had connections with numerous figures with the Mosque. To begin with, some sources suggest that the Prophet's Apostle Abu Ubaida Ibn Al-Jarrah was the designer of the mosque14. What is more, there are the Mihrabs which, apart from the centre, were originally built for maqsuras which belonged to infamous people. The Companions Mihrab belonged to the Maqsura of the Companions, which was built by Caliph Mu'awiya. This was the first of its kind in the history of Muslim architecture. The Hanafite Mihrab was part of the Hanafite Maqsurah, which was used mainly for educational purposes by this school of Muslim thought. Withstanding the Companions and central Mihrabs, one may also consider the place where the famous apostle Abu Dardaa or Ibn Jubayr is believed to have prayed. Moreover, the presence of the original copy of the Quran, one of the three copies the Caliph Uthman compiled directly from the Prophet's Companions recitations, is another element adding to the historic and religious importance of the Great Ummayyad Mosque. Al-Harawi also indicated that the western minaret of the Mosque received two famous figures in Islam, al-Ghazali (1058 - 1128), and Ibn Tumart15 (1080-1130). The former was a famous theologian while the latter was a famous Berber religious leader and founder of the Almohad (the proclaimers of oneness of God) dynasty in North Africa. Furthermore, the tomb of one of the 12th centuries most revered leaders, Salahuddin or Saladin, is also in the vicinity of the mosque adding further importance to this sacred edifice16. As any profound analysis of the merits of various spatial arrangements of the Mosque, layout would go beyond this brief. However, a concentration on the key innovative elements and their significance, especially in the architecture of the period, would perhaps suffice at this stage. The use of the open courtyard represents a continuation of Arab planning that was used in Yemeni temples as well as in the pre-Islamic Kaaba. Christian, Hellenistic and Roman plans were renown for their covered plans. 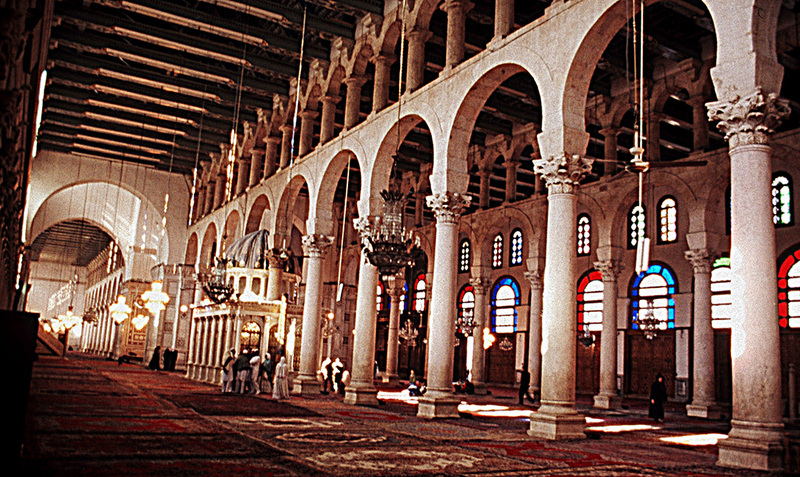 The use of porticoes on the three sides of the courtyard is also a precedent employed in the Prophet's Mosque. The accentuation of the main nave leading to the Mihrab equipped with a large dome, which also appeared in the Al-Aqsa Mosque, was one of the fundamental elements of the mosque plan introduced by the Ummayyads and later became an essential feature of Mosque architecture. As an outcome of the use of columns to support the roof, aisles were introduced in the Prophet's Mosque and later in Kufa. The introduction of Al-Maqsurah in this Mosque also set a precedent which later became an integral part of mosque furniture. The method employed in the roof of the Damascus Mosque (and in Al-Aqsa17) consists of parallel steep roofs running from east to west18. This then crosses the roof of the nave and runs from the north to the south in another arrangement introduced by the Ummayyads that had no Christian precedent (Golvyn, 1971). The Ummayyad Mosque represents the first instance of the adoption of the square minaret. This later spread, particularly in North Africa and Andalusia. Some historians believe that the European square steeple which appears in European churches was an adaptation of this Ummayyad minaret. The use of the horseshoe arch for structural and decorative purposes in Damascus Mosque is the first ever recorded example. This fact contradicts those views which suggest that Muslims developed upon the horsehoe arch by imitating examples left by the Visigoth in Spain. It is worthy to note, the Muslims reached Spain in 726 CE, more than a decade after the construction of this Mosque. In Summary, this plan appears to us revolutionary. Its spatial arrangements had no precedent in Christian architecture. But it is inspired very much from earlier works of Medina (especially the Prophet's Mosque)… From the antiquity prelobe, the plan maintained the (external) frame, but all the remaining features are innovative except from a few details (such as doors, arcaded aisles, naïve leading to Mihrab) which appear to be borrowed from a well defined local (Syrian) architecture. The remarkable balance of the building mass and various elements do indeed honour the architect who knew how to meet the needs of the new architectural spirit". In decorative terms, the Mosque was adorned with marble mouldings and mosaics, although most of the originals were destroyed in previous fires. These mosaics, as they appear in the façade of the sanctuary, consist of urban landscapes. There is a consensus that the artists in charge of these remarkable works were Byzantine. In addition to the fact that the Byzantine were the main masters of mosaic decoration at that time, the characteristics and style of these works greatly resembles that which is typical of Byzantine works (Creswell, 1958). Creswell also relied on some Arabic texts which referred to the co-operation of the Byzantine Emperor who sent materials and artists as mentioned previously by Al-Maqdassi. According to this theory, Caliph Al-Walid sent a former request to the Byzantine Emperor for these artists. However, Grabar (1976) seemed puzzled by this idea as the Ummayyads already executed similar mosaic works on the Dome of the Rock in Palestine. Leading him to question why Al-Walid would request the Byzantine Emperor for these artists. Grabar put forward two possibilities; the first being connected to symbolism whilst the second was related to the psychological and personal characteristics of Al-Walid. The symbolic significance involved the subservience to the Muslims of the Byzantine Emperor. Al-Walid's request can be understood as an order to the Emperor. These mosaics, as suggested by Scerrato (1976), appear to symbolise the "world pacified under the sway of Islam in an idyllic version of a Golden Age." As for personality reasons, Grabar suggested that Al-Walid's snobby character was behind his choice of these artists. He knew that good mosaic works could only come from them and therefore he wanted to portray his prestige. Such explanations are then said to be a great deal away from historic truth as well as from the noble character of Al-Walid. It is well known customary tradition of Muslim Caliphs to dedicate a "Great" mosque as a symbol of their religious affection and closeness to God, the Almighty. They often gave up their most valuable possessions towards the construction costs. A recent example of such sacrifice came in the 1990's when King Hassan II of Morocco financed a huge project of his Mosque in Casablanca. Moroccan workers also volunteered with two days wage. Such enthusiasm comes from the authentic Hadith (prophetic saying) narrated by Al-Bukhari in which the Prophet Mohammed said: For whom builds a Mosque, Allah will build for him the same in Paradise". By calling for artists and masons from various lands (not only Byzantium), Al-Walid obviously wanted the Great Mosque to be as luxurious and prestigious as possible hoping to secure similar grandeur for his promised Palace in Paradise. Furthermore, the depiction of these mosaics to Paradise, which is described by both the Quran and Hadith as containing palaces and gardens of fruit and palms, is a good expression of the Caliph's intentions. The concentration of these mosaics on the main entrance of the sanctuary indicates that the worshipper is entering a garden or a palace of Paradise. In addition to Mosaics, the Ummayyads employed other art forms and styles in the Mosque. The use of decorated marble panels, carved wood, and glass mosaics in addition to repeated semi-circular and horseshoe arcades produced the desired effect of both holiness and grandeur. Please click here for more images! 1According to al-Idrissi and Creswell, the area was occupied by an antique temple of the God of the Aramites (Damascus was then named Iram), with the arrival of the Romans they converted it to the temple Jupiter. Later under the Byzantine Christians, the temple became known as St. John the Baptiste church. 3Such as the reconstruction of the Prophet's Mosque at Medina. 4Although in the Muslim opinion, this is one of the highest examples of Islam's tolerance contrary to the events that occured under the Spanish Inquisition with Muslims and their mosques in Spain. 7Whilst the church was in the western side. 8An amount representing a percentage of land product given as a charity by farmers and collected by the State. 9In another account, Creswell (1959) cited Abu-al-Baqa who thought the structure was built by al-Walid before 715. 10Creswell (1932) considered the Mosque of Amre ibn Al-Aas in Al-Fustat (Cairo) to be also a descendent of the Prophet's Mosque. He suggested that it constituted a covered sanctuary of a large Mussalla with courtyard. 11Some scholars believe the lowest part of this minaret belong to the antiquity temple. 12Other claims include the tomb of Aisha bint Abu Bakr, who is burried in Baqi Cemetery in Medina, which he suggested to be in the mosque under the treasury dome. 14According to Al-Nwiri (d.1331) Abu Ubaida was also the designer of the Mosque of Homs (Syria). 16There have been claims, by some early Arab scholars, suggesting that the head of al-Hussain, son of Ali (Cousin of the Prophet and the 3rd Caliph) is buried there. 17According to Sauvaget (1932, p.69) the Prophet's Mosque at Medina had similar roof characteristics under the reconstruction of Al-Walid. 18Reflecting the aisles of the sanctuary.